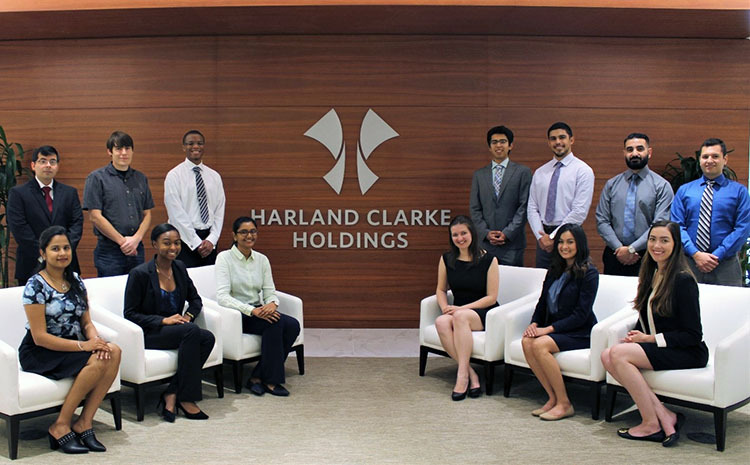 Thirteen UTSA College of Business students are gaining valuable real-world experience this summer working at Harland Clarke Holdings. Headquartered in San Antonio, Harland Clarke Holdings consists of a portfolio of brands including Harland Clarke, RetailMeNot and Scantron. UTSA business interns are playing an integral part in their business operations working in accounting, client relations, controllership, data analytics, internal audit and information technology. Tracy Conner, a senior majoring in finance and real estate finance and development, credits networking experience gained through student professional organizations for opening the door for her business continuity internship with the company. “My involvement in student organizations has given me a chance to interact with executives from the Big Four accounting firms and gather industry knowledge firsthand from other working professionals,” said Conner, who is the president of the college’s chapter of the National Association of Black Accountants and executive vice president of the Forum of Finance. Internships provide students with exposure to corporate life and allows them to develop lasting business connections. “The project that I am most proud of completing involved analyzing monthly financial data for each part of the business and its products and services,” she said. Rebecca Jara, talent acquisition program outreach specialist at Harland Clarke Holdings, believes internships provide students with confidence and understanding and allow them to explore their chosen field of study.